There was another day of superb racing at the 44th Antigua Sailing Week. The breeze built during the day providing the competitors with scintillating sailing in glorious sunshine with increased swell providing blistering downwind action with the big boats fully launched at over 20 knots of boat speed as they careered around the tight windward-leeward courses off Rendezvous Bay. Eduardo Perez-Bengochea’s Gunboat 62 CucuBelle won both of today’s races and are now clear leaders in Multihull 1. Lloyd Thornburg’s Gunboat 66 Phaedo lies second overall after three races, but Greg Giglotti’s Tribe has narrowed the gap and is now only a point behind Phaedo. Carol Swift and Stefan Lehner’s Passion 4 C is top of the leaderboard in Class 2 after today’s racing but Peter Harrison’s Farr 115 ketch Sojana is only a point behind them. Paul Fevang’s beautiful Norwegian Swan 66 Godot lies third overall. Dig Van Der Slikke’s Grand Soleil 43 D-Trip had a great second day at Antigua Sailing Week, catapulting them to the top of Class 3 pushing the American Swan 42 Arethusa, owned by Philip Lotz, into second overall and Antiguian J/122 Lost Horizon into third after three races sailed. In Class 4, Calvin Reed’s First 40.7 Elandra kept up her perfect score line. The Tampa, Florida-based boat is the clear leader overall. Sir Hugo Bailey’s First 456 Hugo B had a consistent day to extend its lead over local rival Caccia alla Volpe, owned by Carlo Falcone. Jonty Layfield’s immaculate Swan 44 Sleeper scored two bullets today, taking them to the top of Class 5. Italian First 47.7 Coffea Cruda skippered by Gennaro Aversano, scored two podium finishes today, lifting them up to second overall. Andy Middleton’s First 44.7 didn’t have their best day slipping them down the pecking order to third and are also subject to a protest hearing with Spirit of Isis concerning a start line incident. This year, Antigua Sailing Week has attracted boats from all over the world to compete in the spectacular sailing grounds around the beautiful Caribbean island but not all of them are high-tech race boats. Today it was the turn of the cruising yachts to enjoy some fantastic sailing along the south east coast of Antigua. The race committee set a course which saw the boats tacking into the beautiful bays along the rugged coastline where reefs are aplenty and then after rounding the top mark at the north end of Willoughby Bay the boats turned out to sea to enjoy some electric offshore sailing. Antiguan Geoffrey Pidduck’s Six Meter Biwi Magic took full advantage of the long beat at the start to post its second bullet of the regatta but only by a whisker. Peter Bainbridge’s J/122 SkyHunter II pulled away on the downwind leg but after corrected time, missed out to Biwi Magic by just 10 seconds. Peter Lewis’ and his Bajan team on J/105 Whistler where third. Class 7 is proving to be a very eventful class, after yesterday’s photo finish there was more drama today. Stephen Carson’s Dehler 34 High Tide and Sandy Mair’s Soverel 30 Streaker had a tacking duel. The two local boats where taking advantage of the wind bend in the rocky coves and bays. However, the two had a coming together at a mark rounding and which is now the subject of a protest hearing. High Tide is currently first on corrected time subject to the outcome of the protest. Rick Gormley’s First 38 Elethea was second in today’s race, making it the current class leader. Tanner Jones racing J/30 Blue Peter was third. The crew of Skylark may be racing novices but they were spotted by the Antigua Sailing Week video team pulling off an impressive ‘letter-box’ drop spinnaker take-down. It is all happening in Class 8b, after Limin Carib was disqualified yesterday for sailing the wrong course, the International Jury finally caught up with Islandssol, which also sailed the wrong course yesterday, so they also have been scored DSQ. However today’s race saw Vincent White’s O’Day 35 Seal as victor with Marinus Woerdeman’s Beneteau Oceanis 393 Limin Carib second and Mark Jensen’s Oceanis 393, Sea Life third. Christoph Nielsen’s KH+P Pinel are flying in Bareboat 1 with another win today. 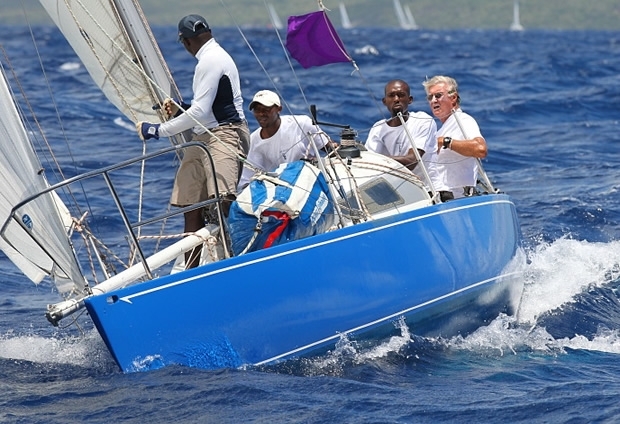 Tony Mack’s Oceanis 50 Sugar Cane was second and Russel Bertrand’s Sun Odyssey Tartane was third. L’Oiseau de Iles skippered by Alfred Geisser scored its first win of the regatta in Bareboat 2 after a close encounter with Alexander Pfieffer KH+P Sea You Later. The result was determined by just 14 seconds. KH+P Clarabella skippered by Beate Mohn was third.